Pascale Massey fights off a defender. The junior forward had a hat trick in Northwestern’s win over Michigan State on Sunday. 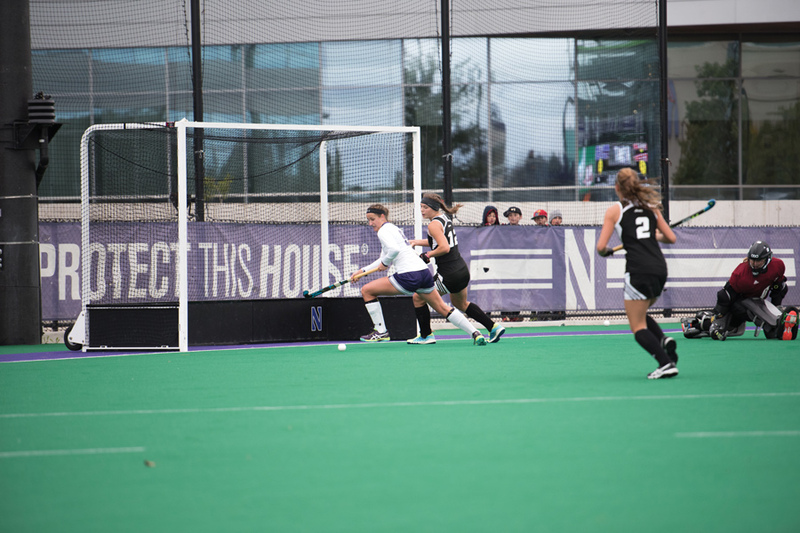 Northwestern finished its regular season in a three-way tie for second place in the Big Ten after splitting its weekend schedule against a pair of Michigan-based opponents. The No. 8 Wildcats (13-5, 6-2 Big Ten) came into the weekend with a chance to secure a share of the conference title, but No. 4 Michigan (15-2, 8-0) dashed those hopes with a 1-0 victory Friday in Ann Arbor. The Cats played the Big Ten leaders tight for the duration of the game, only to concede a late goal after Katie Trombetta’s shot deflected off a NU defender and past sophomore goaltender Annie Kalfas. The Cats registered just seven total shots, well below their average of 16 per game. NU bounced back two days later with an offensive onslaught against Michigan State (8-10, 2-6), dominating the Spartans in an 8-2 win on Senior Day. While scoring opportunities may have been at a premium in Friday’s loss against the Wolverines, they certainly were abundant in Sunday’s return to Lakeside Field. NU outshout Michigan State 22-6 and drew nine more penalty corners than the Spartans. Though Michigan State started the scoring just over a minute into the contest, the Cats rebounded and showed their offensive prowess with six consecutive first-half goals. Massey accounted for half of the Cats’ first-period scoring output –– her hat trick adding to her team-leading 12 goals. Star junior midfielder Puck Pentenga closed out the regular season with a goal and two assists, giving her a Big Ten-leading 16 assists on the year. Pentenga and NU will now look toward postseason play, as they begin with the first round of the Big Ten Tournament next week. After a strong regular season showing, the Cats earned home field advantage for next weekend’s quarterfinal match against Rutgers. NU has been perfect in front of its home crowd thus far, winning all eight games it’s hosted this year. Despite missing out on a Big Ten regular season title, Fuchs said the Cats are confident going into the conference tournament.